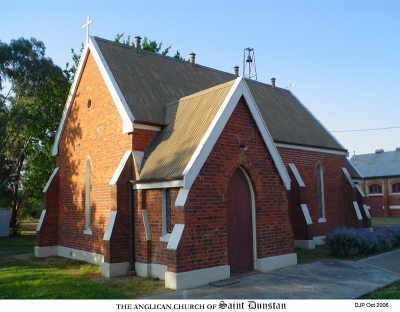 The Anglican Church of Saint Dunstan in High Street Violet Town was built in 1879 and services have been held continuously since then. A full time parish priest lives at the Rectory in Euroa and travels to Violet Town and Longwood – just as has happened through much of the history of this Parish. Violet Town was a parish in its own right for a time and encompassed Dookie and Nalinga churches. The building is one of the few tangible structures in Violet Town of this era and is a reminder of our heritage and the beginnings of this village. Of particular note are the windows built by the renowned premier stained glass window manufacturers of colonial Victoria, Ferguson and Urie. We are very proud to have these fine examples of their magnificent work.